Nobody likes being sidelined at the track due to high engine oil temperatures. Mishimoto is here to help with a new line of efficient Focus RS parts. Some aggressive track laps can overheat your oil and wear out your engine, so our engineers have developed an oil cooling solution for your Focus RS! The Mishimoto engineers designed the heat exchanger for this project from scratch to create the one of largest oil cooler that we offer, and mounted it in the front of the vehicle where it receives the most airflow. Application-specific braided stainless steel lines transfer the oil from the cooler to the engine and feature -10AN fittings for an easy installation. 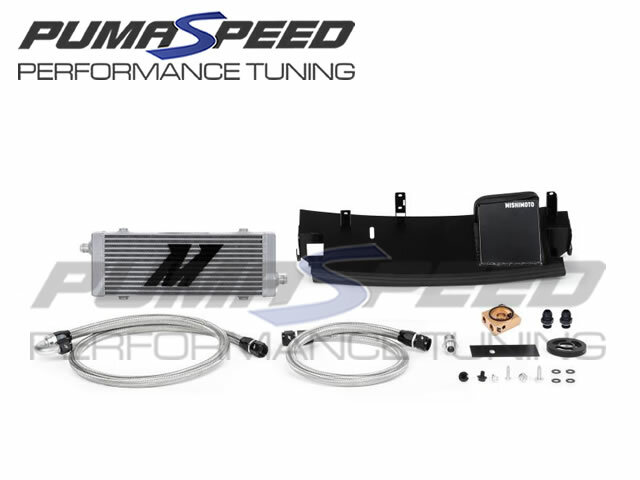 This 2016 Focus RS oil cooler kit is available with either a Sleek Silver or Stealth Black cooler as well as an optional thermostatic sandwich plate. As with all our Focus RS parts, the Mishimoto Focus RS Oil Cooler Kit includes the Mishimoto Lifetime Warranty. The Pumaspeed Workshop team are ready to fit the Mishimoto Focus RS Mk3 Oil Cooler Kit in our Head Office located here. We estimate the labour time to be approximately 2.50 hour(s) costing £195.00 inc VAT. Therefore making parts and labour a total cost £954.50 (inc. VAT). Pumaspeed have a specialist distribution team that can dispatch the Mishimoto Focus RS Mk3 Oil Cooler Kit to any destination worldwide.